Prize bags at mountain bike events are often filled with stuff that is largely of no use to the winner. Obsolete parts and accessories, ill-fitting clothes and out-of-date bike magazines that sponsors are just happy to get rid of feature quite often. So it was a wonderful surprise to find inside a prize bag from the Big Hill Events Dirty Gran Fondo such incredibly practical things as beer (useful for drinking), olives, cashew nuts & Tim Tams (useful for eating) and Nutella (useful for many things including doping). 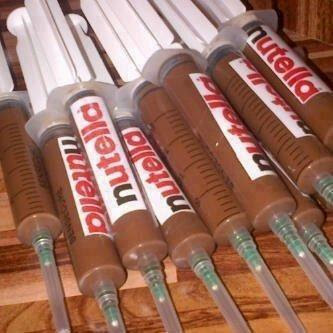 Don’t be surprised if you find these in the rubbish bin of an Italian hotel bathroom after the Giro d’Italia. 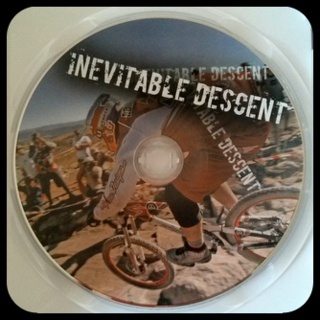 Also included in the bag was an important Australian mountain biking history lesson in the form of the Inevitable Descent – Australian National Series 06/07 DVD. History is a wonderful thing. It allows us to reflect on the incredible achievements and failures of the past, to relive great moments, honour champions and hopefully learn from experience. Finding this DVD was a great and welcome surprise as my memory of the 2006/07 National Series for Downhill (DH) and Four-Cross (4X) is rather hazy. Actually, come to think of it, back then I’d never even watched a DH race and I probably thought that four cross was a knitting pattern. This DVD is a Humphreys family production, who, alongside Hollywood’s Joel & Ethan Coen, must certainly be at the forefront of contemporary sibling filmmaking. The Coen brothers have produced films on such diverse topics as kidnapping (Raising Arizona & Fargo), gangsters (Miller’s Crossing), murderous psychopaths (No Country For Old Men) and bowling (The Big Lewbowski). The Humphreys duo, however, have chosen to focus mainly on documentarial (surely that's a word evil spellchecker?) 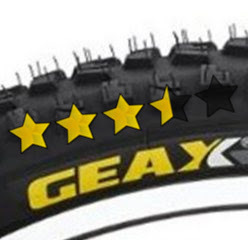 mountain bike videos, of which Inevitable Descent is their debut feature. Hollywood’s most famous film making siblings, the Coen brothers alongside a Humphreys brothers feature. The title itself is enough to hint that this Humphreys brothers film is a little deeper than most MTB videos. Personally, I’m hoping they diversify into track cycling films (surely they’d have to consider Impending Skinsuit as a title) or perhaps a film about cyclocross (Probably Muddy?). One of the central themes is revealed early on with the obligatory introductory montage of various high and low-speed crashes. 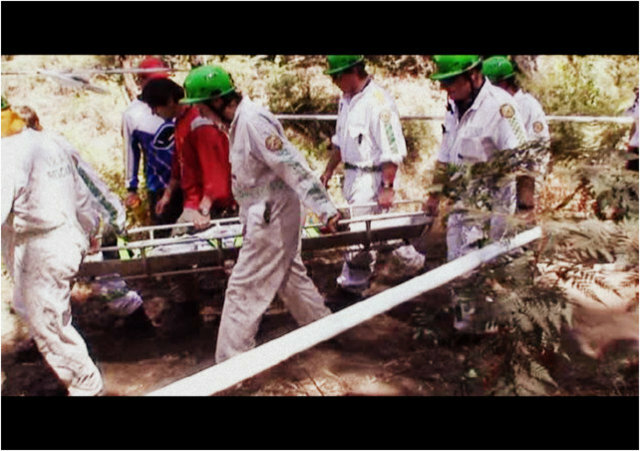 There was only one ambulance featured (from the Mount Beauty DH round) however, a gratuitous stretcher evacuation scene starring a team of men in what appear to be white bio-hazard suits and rather fetching bright green helmets certainly highlights how dangerous this sport can be…and how professional a well-dressed and well-drilled rescue team can look. If you’d like to experience a medical ‘evac’ but you’re not interested in war, then perhaps Downhill MTBing might be for you. Costume design was certainly a highlight of this production. I must admit to initially being surprised to see some riders competing in jeans and woollen jumpers at one of the 4X National Rounds. At first, this was quite disconcerting, but after a few heats it started to grow on me. There are clearly some positives to this apparel choice, chiefly the ability to head home directly after your race without the need to get changed, possibly in public – although this never posed a problem at the Crocodile Trophy. And it does make a nice change from some of the more typical XC mountain biking attire. 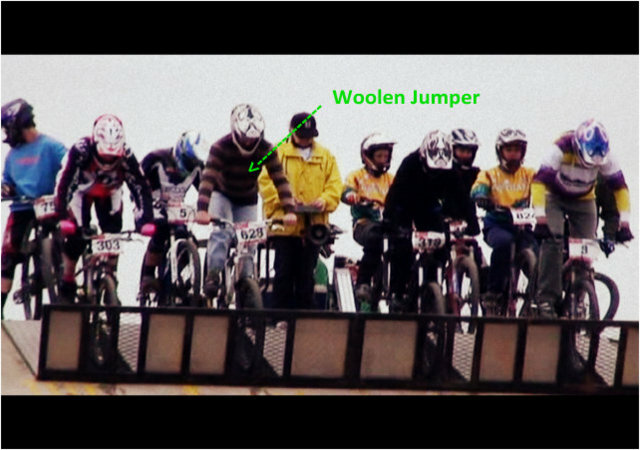 The much coveted World Champion’s Rainbow Jersey, National Champion’s Jersey and Four-cross Woollen Jumper. In the finals, riders were outfit in more appropriate cycling attire, which in 4X still appears to include regular sneakers. Personally, I’ve always thought that cycling events should be contested in uncomfortable shoes because it makes the fights a lot more fun to watch. Some of my favourite scenes were those focused away from the bike riding action. In one memorable scene, a podium celebration (sans actual podium, but complete with sparkling wine) gets quite unruly when one rider is physically restrained in order to pour the remaining contents of a bottle down the back of his neck. While much more sedate, by the following round organisers managed to include an actual podium for the winners, although it did appear to just consist of three large rocks. 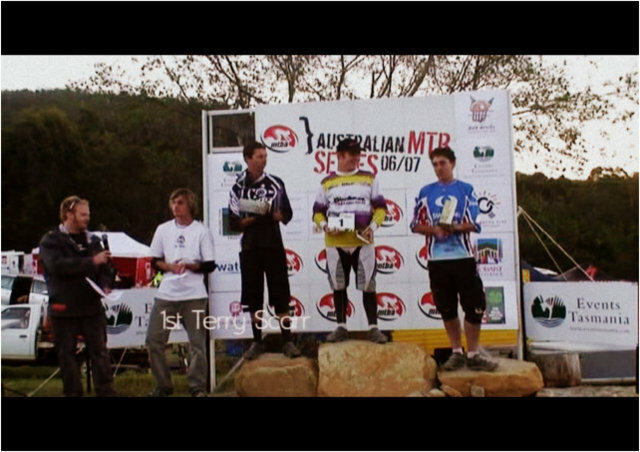 Rocking the podium, MTB style! 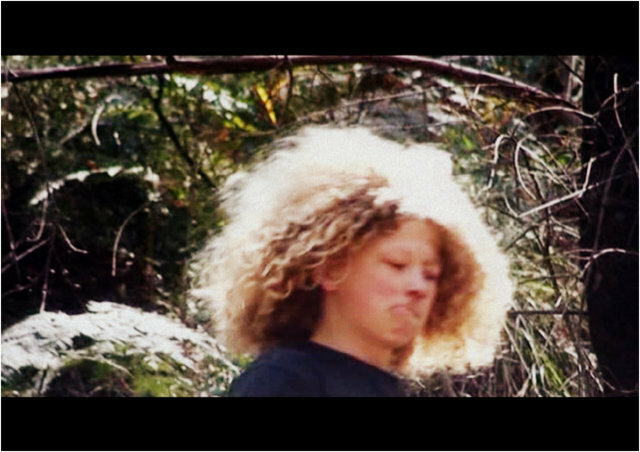 With the entire film shot on location in various parts of Australia there is, unsurprisingly, some stunning natural scenery. One round was hosted in the remote city of Hobart, Tasmania, which despite being an island, is still actually considered part of Australia – although, as of recently (along with the mainland) not for immigration purposes. The music was original, eclectic and carefully selected. Too often this genre of extreme action sports videos is set to a rather typical hard rock soundtrack. However, in this film music as diverse as the sultry tones of French metal band Watcha to the groovy hip-hop of the Dub Pistols certainly livens the mood. 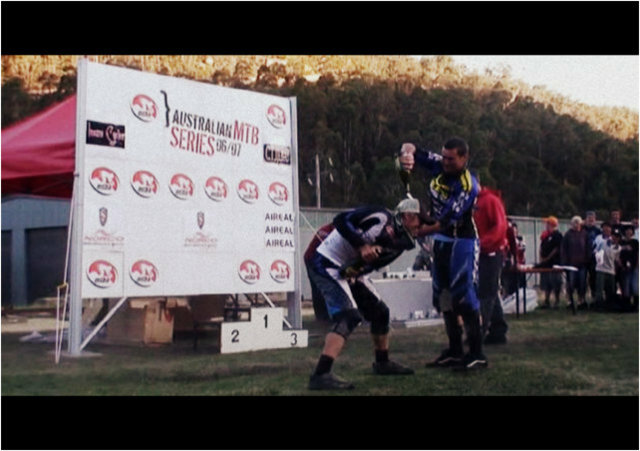 As an educational piece it is interesting to look back at this historical account of Australian mountain biking to see which riders achieved international success. Some names that immediately jump out include: Nathan Rennie (2003 UCI World Cup winner); Jared Graves (2009 4X World Champion); and 2005 Under-19 DH World Champion, Amiel Cavalier – or Ameil Cavalier depending on where you look – after several minutes of laborious research on this topic I’m still not sure which spelling is correct and have found both versions on the MTBA website. If anybody can clarify this I would be eternally grateful...but only temporarily impressed…and incredibly unlikely to offer a reward for your efforts. A film like this would not be complete without some interesting out-takes that highlight how tough this type of extreme riding can be on equipment. While I have certainly broken a lot of bike parts in my time, I’ve never managed to snap a suspension fork like this before…perhaps I’m doing something wrong. 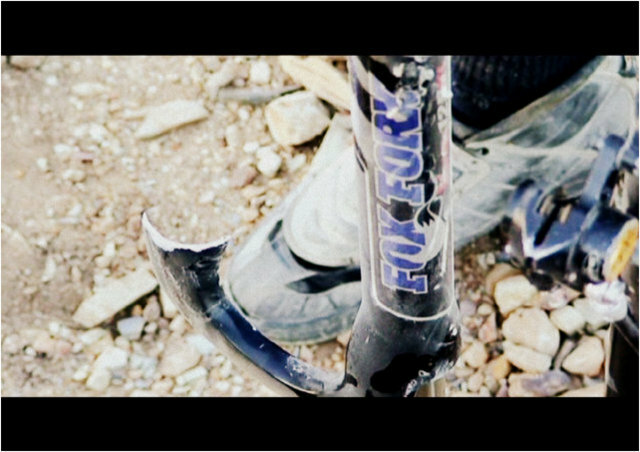 Surely a warranty claim awaits this broken fork...”honestly, I was just riding along”. While the descent is certainly inevitable in DH racing, this film keeps you guessing right up until the end. Interspersed with the racing action, there are riders doing tricks on Dirt Jump bikes, an extended highlights package of four guys riding around the lush trails in Wollongong, some backyard cricket scenes and an impressive mono by a fat guy on a mini-dirt bike. 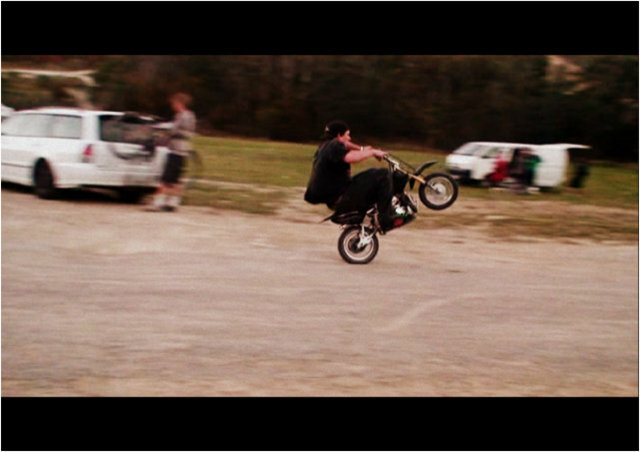 There is nothing funnier than a big guy on a little bike. Inevitable Descent left me wanting more, and I look forward to hopefully one day finding a copy of the sequel, Inevitable Descent 2 – Wide Open in another prize bag (if I should ever get so lucky). After watching the 'cyclists fighting' clip, I'm thinking of starting a road cycling version of UFC. Skinny lycra-clad roadies fighting in road shoes on wet bitumen, who wouldn't pay to see that.